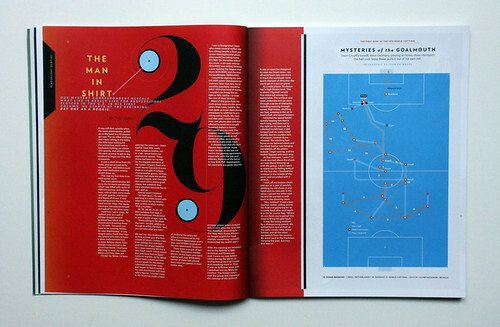 Give a big hand for Howler, a confident, upmarket print magazine for US soccer fans. Howler is a ‘a print quarterly for North American soccer enthusiasts’ edited by George Quraishi and Mark Kirby with art direction from New York’s Robert Priest and Grace Lee (Priest + Grace), writes Peter Robertson. The first issue has launched after a successful Kickstarter fundraising campaign. 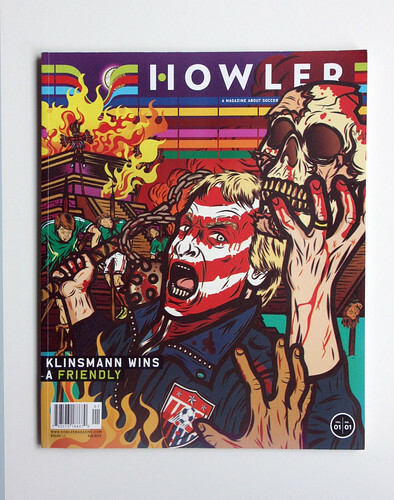 Howler’s cover, a piece entitled ‘Klinsmann Wins a Friendly’ is illustrated by Diego Patiño. 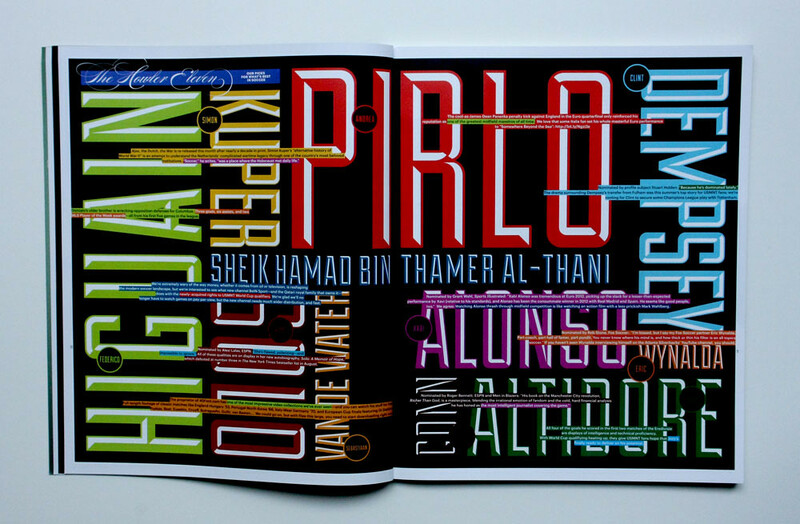 Top: a spread for ‘The Howler Eleven: our picks for what’s best in soccer’. The idea of a quarterly North American soccer magazine may seem bizarrely ‘niche’ but Howler is anything but. Published in a large, square format on coated paper it has all the values of slick high budget production. Coming from a team with backgrounds in Esquire, GQ and several Conde Naste publications, Howler’s execution makes it feel very much of that sector: think Wired rather than Fire & Knives. Illustration by Eden Rodriguez, a regular contributor to the New Yorker magazine. However Howler employs a relentlessly eclectic visual approach throughout, with infographics and illustration very much in evidence. Highlights include a twelve-page timeline of Manchester United and a great story on the super-fans of a Mexican football team (illustrated by Tim McDonagh on page 52). The photography is well selected, and a refreshing change to the usual visual coverage of soccer. 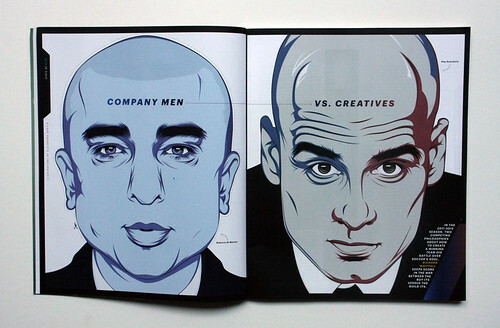 Illustration by Alejandro Garcia, a designer / illustrator born in Valencia. The quarterly’s contents are interesting, full of insights and as diverse as the design: articles on a team relegated from the Argentine top flight sit happily with a piece about pilgrimages to soccer’s holy sites. It is a great mix, with contributions from good sports writers from around the world. Above all you can tell that it has been put together by people with a serious and passionate interest in soccer. 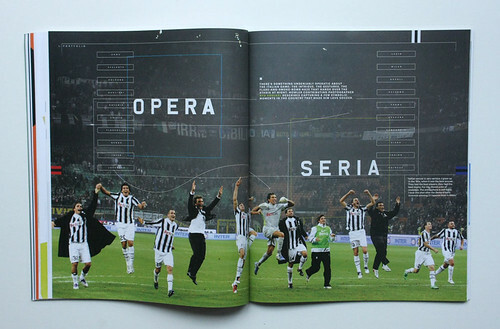 Photographer Ryu Voelkel captures the ‘operatic’ nature of the Italian game. Howler is an exciting and thoroughly genuine take on the contemporary sports magazine; its slower paced, intelligent look at football balanced with a vibrant, energetic visual approach is a very exciting prospect. 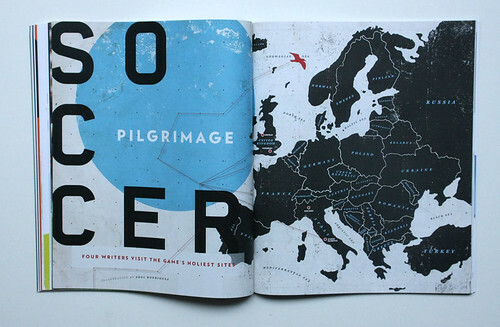 This spread features writing by ‘the player’, a mystery contributor who plays soccer professionally in America.